The newest way to enjoy sweet potatoes? Toast! Sweet potato toast uses thin slices of sweet potatoes instead of bread to hold all of your favorite nutritious toppings. The slices go directly into the toaster, just like bread, to yield a slightly firm but delicious product in just minutes without having to turn on your oven or stove. This snack is a great low-calorie option that can keep you satisfied while also helping you control your weight, an important part of keeping your blood pressure down. Increasing whole foods, like sweet potatoes, in place of processed foods can help you reduce sodium in your diet and increase the nutrients that naturally lower your blood pressure,too. Store-bought bread usually contains a lot of sodium, so switching it out for sweet potatoes is a smart swap for your blood pressure. Strawberry sweet potato toast is also an easy way to add more fruits and veggies to your diet, and with them, lots of immune-boosting vitamins. Sweet potatoes are some of the best food sources of vitamin A, which helps protect the tissues in your mouth, digestive system and respiratory system, as well as increase antibody response to fight off infections. Just one serving of this healthy snack provides over one third of your daily vitamin A needs. It also provides almost half of your daily vitamin C needs. Vitamin C acts as an antioxidant and stimulates antibody response, which can help you fight off infection and reduce the length of colds. 1. Place 2 sweet potato slices in a toaster and toast on highest setting through 2 to 3 cycles, until warmed through. Repeat with remaining 2 slices. 2. Spread each toasted sweet potato with 1 tablespoon yogurt. Top with sliced strawberries and sprinkle with granola and cinnamon. 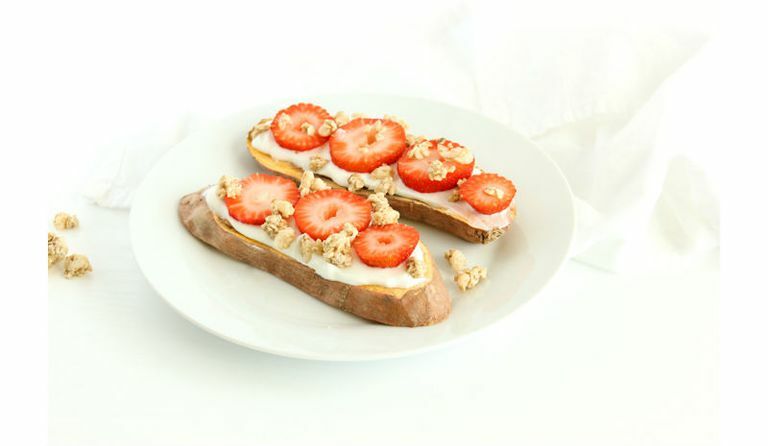 Use any type of fruit or yogurt to switch up the flavor of your sweet potato toast! Other fruits high in vitamin C include citrus fruits, kiwi, blackberries, apricots, and pineapple. For a gluten-free recipe, make sure your granola is gluten-free. For dairy-free or vegan, use coconut or soy yogurt instead of the Greek yogurt. Watch your sweet potatoes in the toaster to make sure they don’t burn. Depending on your toaster, it may take more than 3 cycles for them to cook. If you’re making a large batch, you can also stick them under the broiler for a few minutes on each side.